The nebulous political movement known as “Antifa” has become a topic of national conversation, particularly since Trump’s election to the presidency. The recent vandalism and violent threats left at the entrance to the Republican Metropolitan Club in New York and the violent confrontations that occurred outside have received national media attention. While Fox News emphasized the violent threats issued by left-wing groups, the broader media community has focused attention on the violent actions of members of the right-wing group during the incident. Governor Cuomo, expectedly, completely ignored the threats directed at the New York Republican Party, blaming everything on the behavior of the right-wing groups and Republican officials involved. In general, there is a significant amount of confusion in the media about how to report on encounters between radical right-wing and left-wing groups. While the institutional and radical Left are eager to label their political opponents as fascists or Nazis at the drop of a hat, there is no unified method of identifying the violent extremists on the Left who regularly contribute to these clashes. Those on the Right who want to label or describe the violent left-wing extremists who regularly show up to college campuses and events have a serious lack of developed vocabulary to call upon. This inability of the mainstream to come to an agreed understanding of what these left-wing paramilitary groups are, and why they behave the way they do is very dangerous. History has shown that regular violent confrontations on the streets and in the public square between organized right-wing and left-wing extremists can very quickly spiral out of control. While the left-wing mainstream might want to solve this problem by solely condemning the right out of a conviction that the radical right is morally worse than the radical Left, the problem is that the left-wing extremists will not limit their attacks to their partners on the right and that both extremes reinforce each other. Groups that promote violence and illiberalism on both sides of the spectrum have to be confronted if civil order is to be maintained. While the name Antifa is new to most Americans, it has a very real and documented history behind it. 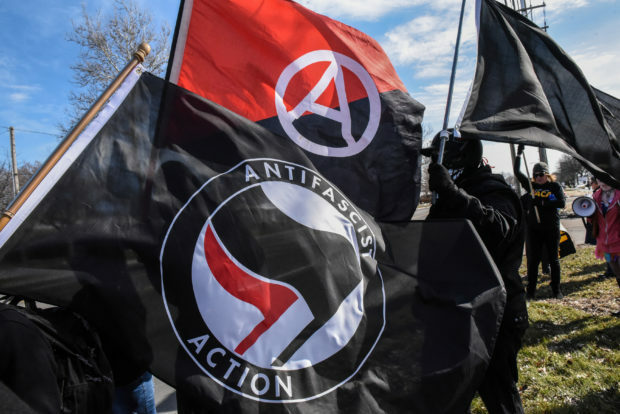 It is common for right-wing criticism of groups organizing under the Antifa banner to mimic the left’s criticism of fascism and Nazism in their descriptions of the group. “Antifa are the real fascists” is the distilled message many on the right promote in opposition to Antifa thuggery. This is problematic because it is not historically or ideologically accurate, and the need to fall back on fascism discourse is largely a function of the poverty of our education system and its inability to properly educate Americans about the basics of political history. While the broad mainstream may not be informed about what the left-wing group is, Antifa themselves and those associated with them are clear about what is inspiring them, and its beyond time that everyone else was too. The briefest of examinations of Antifa iconography and slogans can immediately point to the historical inspiration for its ideology. 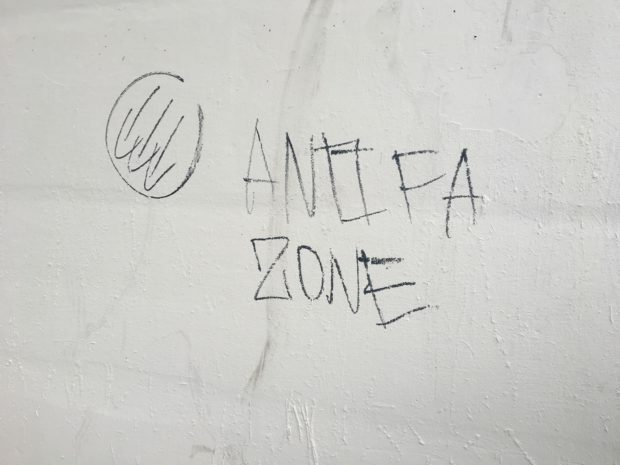 The circle with three arrows and the two flag symbol are prominent on shields, weapons, flags, clothing, graffiti and internet platforms deployed by those who organize under the Antifa banner. Both symbols are explicit references to left-wing paramilitary groups that operated during the German Weimar Republic during the 1920s and 30s before Hitler’s rise to power. The first is taken from a paramilitary group called the Iron Front that adopted the circular symbol so they could paint it over Nazi swastikas. The second is taken directly from the movement that is also Antifa’s namesake: Antifaschistische Aktion. Called into being in 1932 by the German Communist Party in the party magazine, “Rote Fahne” (Red Flag), Antifa, as its American successors have come to refer to it, was meant to expand the cooperation amongst left-wing groups to violently confront the rising power of the Nazis. The reason the German Communists needed to form such a movement in the first place was due to the deep divisions on the German left at the time between the parliamentary Social Democrats and the revolutionary Communists. Communist parties across Europe during the interwar period took orders directly from Moscow (ironic today). The Bolshevik Communist regime of the Soviet Union had existed for over a decade before the creation of Antifa in Germany, and the anti-capitalist and anti-democratic ideas that it was based on had existed long before Hitler entered politics. Soviet dictator Joseph Stalin was at the heart of this global Marxist network and provided the directives that prevented a unified opposition to Hitler, enabling his rise to power. To Stalin and the German Communist Party, Nazism and fascism generally were merely more extreme expressions of the capitalist imperialism they railed against in their Marxist literature. As Antifa has assumed the name of their historical predecessor, they have also assimilated the same pathological, anti-democratic flaw that directly brought about the failure of the historical Antifa to stop Hitler’s rise to power. Antifa’s real spiritual and ideological inspiration comes directly from the violent, anti-capitalist and anti-democratic politics of the Stalinist Communism that created it. Like Stalin, Antifa justifies terrorism and violence against peaceful and democratic opponents by alleging fascism liberally and without restraint. A brief review of Antifa statements online or after notable riots, like those that happened routinely in Berkeley last year, shows that they regard not just racist groups but Trump, the Republican party, American capitalism and ultimately the very existence of America itself as “fascist,” and feel justified to use organized political violence against all of them. 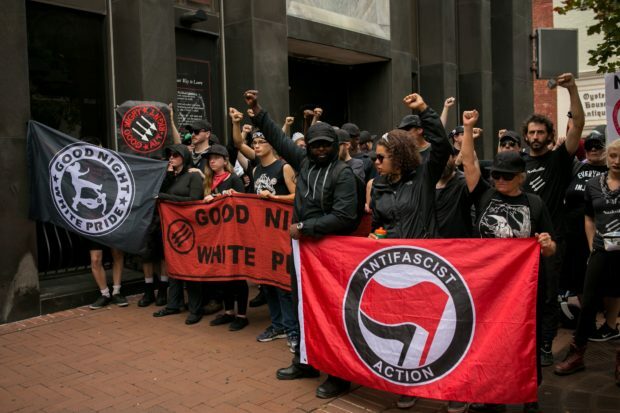 The tragedy is that those who join or sympathize with Antifa out of a genuine desire to oppose fascism fail to understand it is precisely these methods that led to the total failure of Antifa in the 1930s and will fail again if left unchecked. The Left and Right in America need to recognize Antifa for what it is and pull America back from the brink of spiraling illiberalism that leads people to look to a strong leader instead of American values.